If you want your employees to come back to work feeling refreshed instead of sleepy, make sure your cafeteria is relaxing during your employees’ most important break of the day. A lot of office cafeterias have benches or stools to go with their tables. But to truly unwind, you employees prefer seats that they can lean back on after being hunched over work desks. Don’t fix your chairs to the floor. 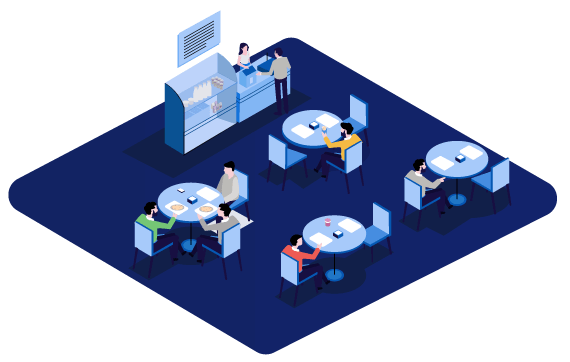 Give your employees the option to move chairs around so that they can fit more people at a table, or find favorite non-table spots around the cafeteria. To go the extra mile for your employees, consider getting cafeteria chairs that are cushioned or covered with a comfortable fabric. They boost employee morale but are tough to clean. Being sat on, carried around, bumped into tables, and dragged along the floor, cafeteria chairs endure a lot of impact. Invest in chairs that are durable and built to withstand everyday use. If your office is running low on floorspace, get the kind of chairs that can be stacked after use. These chairs can be used as spare seating during meetings or casual get-togethers as well.